That plan of weeknotes happening on an, ahem, weekly basis didn’t really last long, did it? In my defense, not much has really moved on regarding my thesis in the last couple of weeks, for two main reasons. Firstly, I was in Geneva at Lift, and since returning to Copenhagen we’ve been fully engaged with an industry project. So it still feels like I need get a proper start on my final project, even as time is ticking. The time at Lift was great, and although it was to some extent a week I spent not really directly thinking about my thesis, it was good to let some of the thoughts to date swirl around and ferment, and there were also some overlaps between some of the talks and my current thinking. Thanks to Russell for the reminders not to forget analogue friction and that there are magnificent bits of infrastructure just lying around. Perhaps that’s my thesis in a nutshell – make better use of that magnificent infrastructure, in some new and wonderful way. In the weeks since coming back to Copenhagen the thesis was put on hold while we switched attention to the first of two industry projects we’ll have. Working with Jacek and Shruti was great, and I’m really happy with the outcome – the overall idea, our strategic positioning for the client, the flow of the presentation, and perhaps most of all, the video we created as a ‘sketch of the future’ as a standalone piece of communication. Sadly, for the time being at least, the work is under the wraps of an NDA, but hopefully it’ll either never be shown because it’s being taken further, or it’ll be released at some point in the not-too-distant-future. From a process point of view – and especially in contrast to my experiences of the service design course – we did not work through the details of a specific solution, but focused almost completely on communicating a vision of the future towards which the client should strive, and within that, combining the needs of humanity with the strategic (business, brand) value of trying to meet those needs. There were some really interesting overlaps between the initial brief and the final outcome with some of my thinking for my thesis, so although there’s nothing direct to report, at least some of the thinking and discussions at the city scale around infrastructures and near-future possibilities we had that will undoubtedly have some positive overflow into that project. Reading has slowed – both because of a lack of time, and also because it’s getting to that stage of the project where I need to do less soaking up, and more focusing and creating! Nonetheless, while in Geneva, I picked up Birkhäuser Basics: Urban Analysis (2009), a thin volume by Gerrit Schwalbach, which gives an excellent and brief introduction to the analysis of urban contexts from an architectural and urban planning perspective. Publisher’s blurb, here. Note to self: do not expect to go into a design/architecture bookshop and leave empty handed. 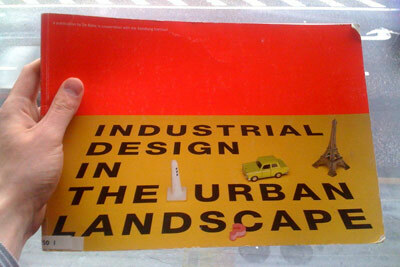 I also picked up a strange but very useful publication from the library: Industrial Design in the Urban Landscape, which was published in 1994 by De Balie together with the Sandberg Institute in the Netherlands. It feels remarkably dated (I mean – will you look at that cover?! ), but it’s a fascinating read, even as that viewpoint throws a new light on my current thinking. The thoughts on urbanism and cities come, logically enough, on the back of the 80s, and seem to have been written in a time when the collective vision of cities was a pessimistic, negative, and uncertain one, quite in contrast to the feeling I’m getting from more contemporary writing and thinking. ‘Information Technology’ and its consequences seem to be a big unknown, as opposed to a simple fact of life. Information and data are only very briefly touched upon as something for designers to consider and shape – and only in the sense that they should work together with “software design and mechatronic technologies” (p 8). But it also, as the title suggests, comes from the perspective of industrial design as a classical form-giving discipline, which, interestingly (and to me surprisingly), seems to have been one that was still figuring out it’s role in the world – much later than I would have imagined. The publication seems to be a manifesto for industrial designers to engage with the urban, civic realm – something that now, to me, seems self-evident. But reading it 15 years after its publication, it’s interesting to note the parallels between industrial design searching for it’s role in an urban context, and me, now, here, as part of my thesis, questioning the role interaction design(ers) should play in the same space. My advisor also lent me a copy of Mobilities (John Urry, 2007), which looks at different issues around movement and mobility from a sociological perspective, which I have been looking at, but don’t think I’ll have the time or brainspace to properly engage with as a whole – but I’ll certainly read a couple of the chapters once I’ve got a more narrow focus sorted out. My next step is clearly to take all the very much stop/start thinking and reading I’ve done to date, and spend a little bit of time consolidating, summarizing, and identifying a couple of very specific areas, ideas, or opportunities that I want to focus on. From there on, I can run with it. But I need to get there first. Jack Schulze, Timo Arnall, and Matt Cottam will be with us again for a couple of days this coming week, and will hopefully help us narrow our thinking and give us new and exciting directions to ponder – and maybe make some decisions obvious, and help me figure out the ones that are less so. I’m also hoping to run or co-run a Systems/Layers walkshop, ala Adam Greenfield / Do Projects, here in Copenhagen, in the near future (towards the end of June, hopefully), if we can figure out the logistics, which would be extremely exciting. That should also be a great way force me to think in a very focussed way about some of the things I’ve been thinking about at quite an abstract level for a while. 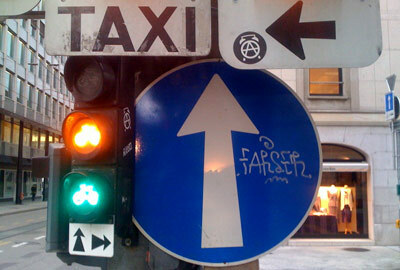 So – in search of focus I go.